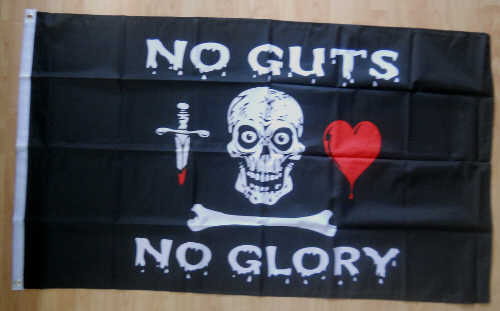 Pirate No Guts No Glory Large Flag - 5' x 3'. Pirate A Pirate's Life for Me Large Flag - 5' x 3'. Pirate Beatings Large Flag - 5' x 3'. Pirate Blackbeard Lives Large Flag - 5' x 3'. Pirate Commitment to Excellence Large Flag - 5' x 3'. Pirate Crossed Sabres Large Flag - 5' x 3'. Pirate Dead Men Tell No Tales Large Flag - 5' x 3'. Pirate Gallery Large Flag - 5' x 3'. Pirate Jack Rackham Large Flag - 5' x 3'. Pirate Jolly Roger Red Eyes Large Flag - 5' x 3'. Pirate Name Your Poison Large Flag - 5' x 3'. Pirate One Eyed Jack Large Flag - 5' x 3'. Pirate Pink Pirate Large Flag - 5' x 3'. Pirate Prepare to be Boarded Large Flag - 5' x 3'. Pirate Red Bandana Large Flag - 5' x 3'. Pirate Red Skull Large Flag - 5' x 3'. Pirate Skull and Crossbones Large Flag - 5' x 3'. Pirate Skull and Fire Large Flag - 5' x 3'. Pirate Skull with Swords Large Flag - 5' x 3'. Pirate Surrender the Booty Large Flag - 5' x 3'. Pirate Time Flies When You're Having Rum Large Flag - 5' x 3'. Pirate What Happens On Board Stays On Board Large Flag - 5' x 3'.